DETROIT, Mich., —Michigan has come far, but has much more to do to become even stronger and a “Top Ten” state for jobs, personal income and a healthy economy. It will require all Michiganders and our elected leaders coming together to propel our state forward by focusing on core issues like improving our K-12 education and job training systems, making college more affordable, and strengthening our infrastructure and fiscal stability. 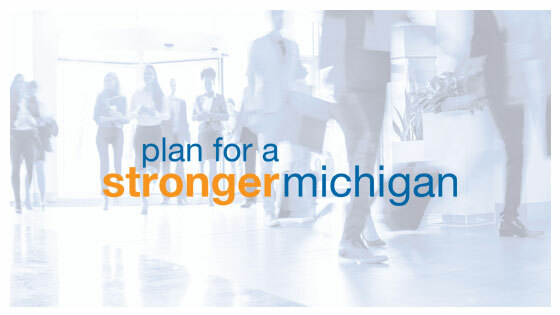 That was the message as Business Leaders for Michigan (BLM) unveiled its Plan for a Stronger Michigan, its action plan for maintaining and accelerating the Great Lakes State’s economic turnaround. BLM also thanked the governor and lawmakers for some of the meaningful changes they’ve made to advance the state forward, but cautioned that Michigan’s work isn’t done. Rothwell explained why being a “Top Ten” state is important, “To put things into perspective, if Michigan were performing like a “Top Ten” state today, there would be 34,000 more Michiganders employed and per capita personal income would be $9,500 higher. Strengthen the state’s fiscal stability. The plan calls for reductions in state and local debt, cost estimates for proposed legislation, and greater service delivery across jurisdictions. Produce more skilled and educated talent. Ensure that every child is ready to learn and advance by improving K-12 performance with maximized support for teachers and principals, increased accountability and the maintenance of high student standards and assessments. Move Michiganders into good paying jobs quickly by making job training easier to navigate for employers wishing to locate or expand in Michigan through the establishment of a single point of contact for employers and customized on-demand job training programs. Improve Michigan’s aging infrastructure. Form an infrastructure planning council to prioritize needs, achieve greater coordination between regions, ensure long-term planning and better asset management, and incentivize localities to improve water infrastructure. Utilize user fees to pay for transportation and water infrastructure needs and expand broadband in underserved areas. Grow Michigan’s economy by leveraging its unique assets, most notably its potential as a Global Center of Mobility. Michigan’s automotive industry represents the single largest potential growth opportunity for the state. Ensure the state’s economic development efforts are growing the results we need. The state needs stronger approaches to business attraction, as well as a unified economic development strategy. BLM also showcased Raise Your Hand for a Stronger Michigan – its public awareness campaign designed to raise awareness and support of the steps needed to make Michigan a “Top Ten” state, and to help alert voters to how candidates align with the Plan for a Stronger Michigan. To get involved, learn more or get a full copy of the plan, visit StrongerMichigan.com.